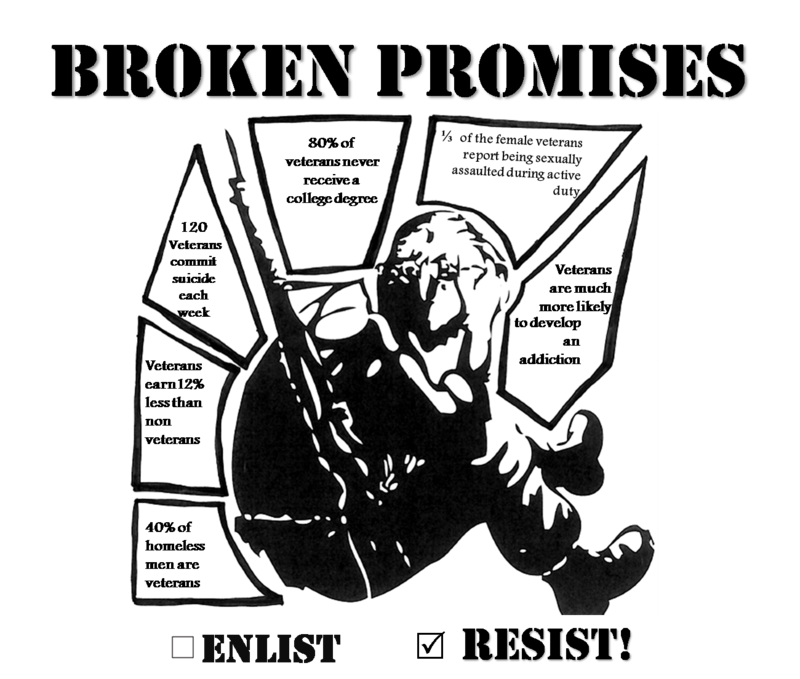 Some of you may know that there has been an ongoing effort by AFSC to address the unjust disproportionate recruitment of low income Georgia youth into the military industrial complex. For several decades struggling Georgia youth have been the target of fairly aggressive recruitment tactics that include the promise of well paid post military jobs, the promise of avoiding a combat zone, the promise of a great education, and more. 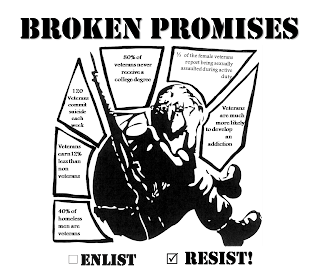 We know that statistically speaking these promises are rarely kept, leaving the majority of young recruits hurt, not helped by their military service. 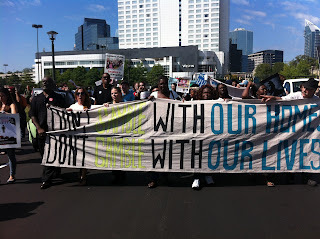 fast, and we need to act now. Every year tens of thousands of Georgia youth take the ASVAB(Armed Services Vocational Aptitude Battery test), many don't even know what it stands for. There are two lies that perpetuated in regards to this test. 1. It's a test designed to help you decide what career paths might be good for you. 2. It's a mandatory test. better recruit you. The test is absolutely not required. http://www.acluga.org/files/2413/4573/1160/ASVAB_GA_Superintendent_Letter.pdf,to address some of the concerns with the ASVAB test. write-a-thon is co-sponsored by the Student Career Alternatives Program, ACLU Foundation of Georgia, and the Georgia Peace and Justice Coalition-Atlanta. Over the past few months American Friends Service Committee has actively organized alongside Occupy Our Homes, Right to The City, and the Home Defenders League in an effort to challenge Fannie Mae and Freddy Mac to not only reduce mortgage principles to actual current values, allow struggling homeowners to rent or buy back the homes they've already lost, and turn over the countless abandoned homes they've been sitting on for years to non-profits and community orgs committed to the neighborhoods these empty homes exist in. 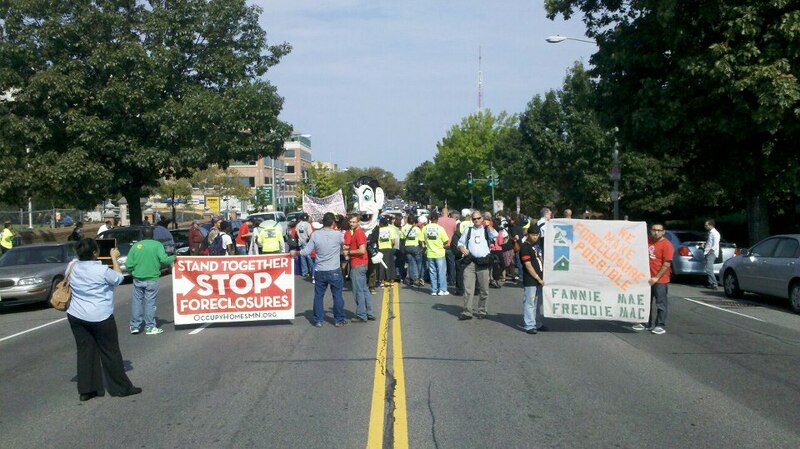 After pulling off actions at every regional Fannie/Freddie office in early September, several cities decided to send delegations to Washington DC to confront Freddie and Fannie at their national offices. 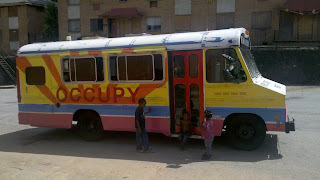 With little time to organize, we were able to pull eleven folks from Atlanta to make the trip. Micheline Meusa, Renika Wheeler and their two children were among our Atlanta delegation. Both have lost jobs in the last six months and as a result of having a very limited safety net they ended up on the street. Renika and Micheline have bounced from shelter to shelter and have been unable to obtain work, despite looking for work almost every day. Renika and Micheline represent a segment of the population that has, up to this point, often been left out of the housing crisis conversation. One thing that was exciting about today's action was having the story's of homeowners, renters, and homeless elevated to the some importance. The sad fact is that Atlanta has six empty homes for every homeless person, and Atlanta is full of homeless people now more then ever. 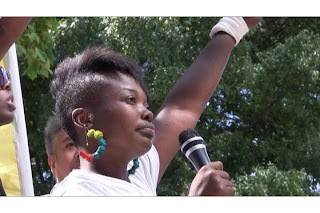 After demonstrating outside Fannie Mae this morning, five people impacted by Fannie's practices decided to commit an act of civil disobedience that landed them in jail, Renika was one of them. She's out now! After leaving Fannie we made a quick trip to Freddie Macs headquarters, then we decided to do something special. All of us went to Edward Demarco's to not only give him a piece of our mind and deliver a pink slip, we also had a pizza party on his lawn. Brigitte Walker and Chris Frazer Go To Washington!!! Yesterday, community leaders, advocates and housing experts traveled the Nation’s Capital to meet with White House officials about implementing the necessary solutions to the housing crisis that has enveloped Georgia. American families continue to face a crisis in housing, with 2 million foreclosure filings this year, and millions more at risk. Over 15 million homeowners are underwater, meaning that their home is worth less than they owe on their mortgage. Georgia is projected to be one of the hardest hit states in the nation this year. The crisis is rooted in wrongdoing by lenders and Wall Street and inadequate rules and enforcement. The misconduct included predatory sub-prime lending, targeting of senior citizens, veterans, and communities of color, and bundling and pawning off flawed mortgages, avoiding accountability. Those forces combined with record long-term unemployment to bring our economy to the brink of collapse, and continue to jeopardize our economic recovery. The White House invited Brigitte Walker and Christine Frazer, both with Occupy Our Homes, ATL to discuss their priorities and possible solutions to the crisis moving forward. They were joined by over 150 other advocates and experts from across the country. Brigitte Walker had the special honor of addressing the whole delegation, which included senor White House staff. She received a standing ovation on more than one occasion. Brigitte and Christine met with key White House officials, including about specific solutions ranging from principle reduction and affordable housing. After the White House meeting, participants visited the offices of Senators to urge them to lead on bills currently under consideration, and other potential solutions to the housing crisis. We are very excited that Christine and Brigitte where the ones who were chosen to represent Georgia and find them to be extremely appropriate choices as they both have struggled hard through our states historic housing crisis. We are also very grateful to the Home Defenders League for making their trip possible! UPDATE: As of this morning we've confirmed that the HomeRight program isn't real. The press release, and the contact claiming to be Andrew Wilson, were part of a hoax. I will say the language was extremely well written. 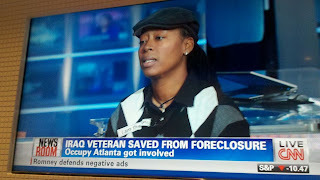 Stopping the bulk sale of foreclosed homes to investors at reduced prices. We've asked Mr. Wilson if he would provide clarity to our confusion and expect to hear back from him very soon. For now, we're assuming HomeRight is to good to be true. We just got word that Fannie Mae is stating a new three point program call HomeRight, which addresses many of the issues we've been concerned about. 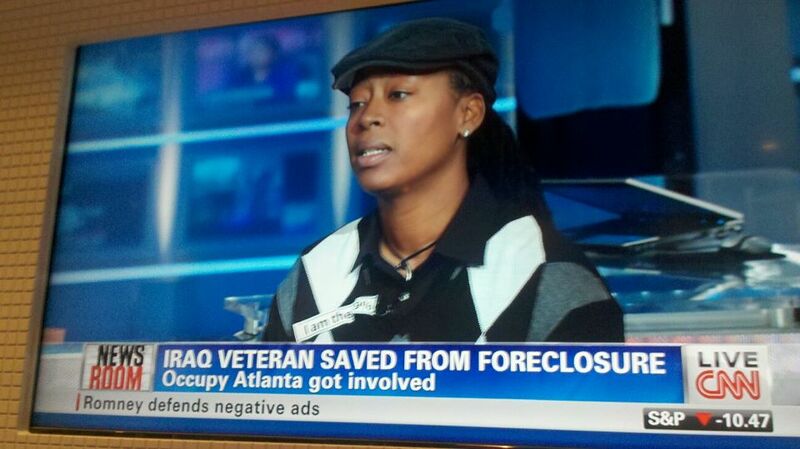 Today, we find ourselves in deep gratitude to Fannie Mae for doing the right thing! A fairly rare occurrence these days! WASHINGTON, DC – Today, Fannie Mae (FNMA/OTC) announced that it will launch HomeRight, a three point community relief program designed to help more homeowners avoid foreclosure and improve community and housing market stability. As the weak housing market continues to be a burden on overall economic recovery, this new program will address the factors inhibiting market stabilization, such as negative equity held by many homeowners and the large quantity of vacant and REO properties held in Fannie Mae and other lenders' portfolios. Through participation in the Home Affordable Modification Program - Principal Reduction Alternatives (HAMP - PRA), as well as Fannie Mae's new pilot program HomeRight, servicers will be required to write down mortgages owned by Fannie Mae to reflect their current market value. As recent Fitch Ratings analysis shows, using principal reduction (PR) to reduce loan-to-value ratio (LTV) increases the borrowers' ability to pay, and the re-default rate is significantly lower for loans modified with principal reduction, compared with loans modified only with payment reduction options. Principal reduction will also help create more demand in the housing market, as having equity in the home allows for young families to trade up to bigger places, and for empty nesters to downsize more easily. HomeRight will also address the growing backlog of REO properties by implementing new initiatives designed to reduce the number of vacant homes on the market, balance the decline in home values, and provide stability to displaced homeowners affected by foreclosure. Homeowners who were foreclosed on between 2007-2011 will have the option to buy back their former home -- or, if unavailable, a comparable home in the same neighborhood -- at its current market value. Lease options will also be implemented for those unwilling or unable to explore homeownership. These lease options will also be extended to current homeowners facing foreclosure who wish to remain in their home, but can no longer afford to own. A new help desk and call center will be created to help administer this new program and ensure its efficiency. Finally, through the HomeRight program, Fannie Mae is working with non-profit and community organizations dedicated to providing affordable housing to the growing number of displaced families facing homelessness. These organizations will be provided grants to be used in the rehabilitation of homes in distressed markets, which once completed will be turned over to those communities to provide long term affordable housing options. These new initiatives will continue Fannie Mae's goals of fostering a liquid, efficient, competitive, and resilient national housing finance market, while protecting the American dream of homeownership and stable housing options for all. 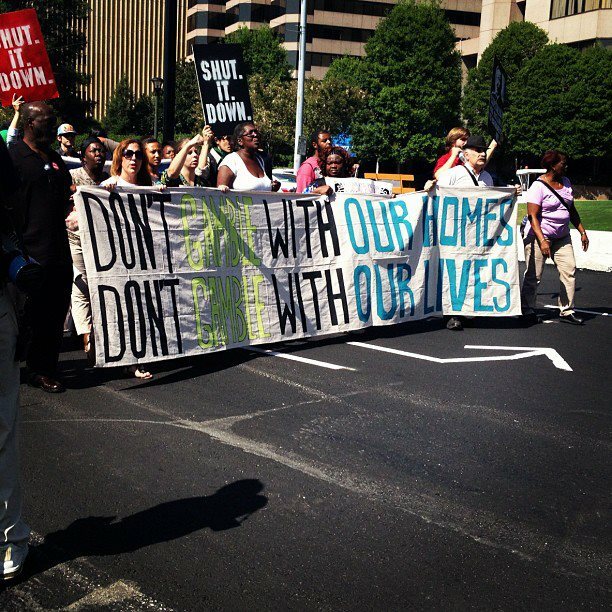 ATLANTA -- Today, September 10, 2012 at 11:00am, Occupy Our Homes Atlanta, American Friends Service Committee, along with people from all over the Southeast marched on Fannie Mae's regional headquarters in the heart of Atlanta’s most affluent real estate; Buckhead. Today’s Southeastern action launched a national campaign aimed at highlighting and addressing the inhumane practices of Fannie Mae and Freddie Mac. 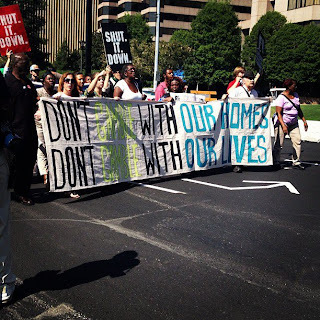 People from Athens, Chattanooga, Miami, Orlando and Nashville joined Occupy Our Homes ATL organizers in holding Fannie and Freddie accountable for their abuse of our system and demand change. 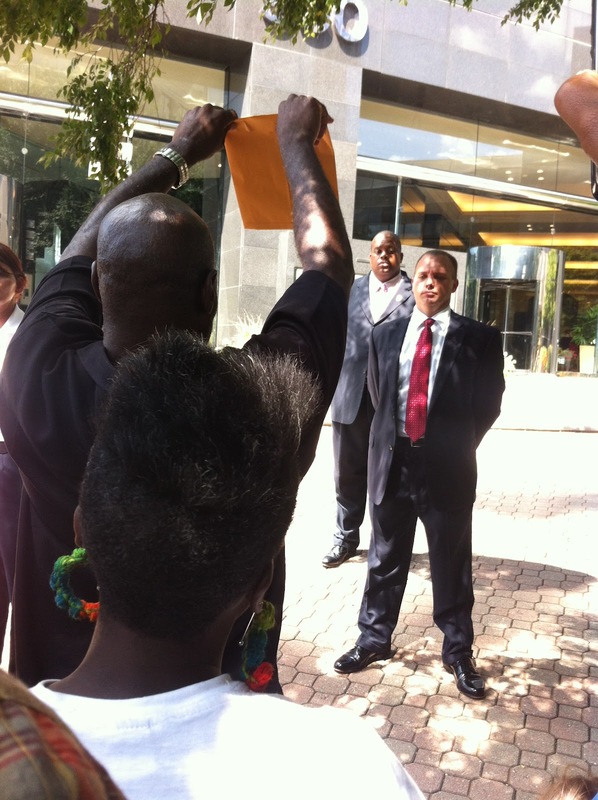 Many underwater homeowners who Freddie and Fannie refuse to work with were present and demanded a meeting with Catherine Lasher of Fannie Mae. Robert Anderson, whose home is underwater, said he has tried to modify with Freddie Mac but with no luck. "I want the investors to step down and talk to us," Anderson. "I've been going through anxiety." Currently Georgia is near the top of the list of most devastated states in this foreclosure crisis and as a region, the Southeast is the hardest hit per capita. Homeowners, renters and the homeless have been devastated by unjust practices that include refusal to reduce principal, bulk sale of homes to investors at 10-20% of market value, and holding properties hostage in communities hit hardest by the crisis. In Atlanta there are six vacant homes for each homeless person. This is not acceptable. 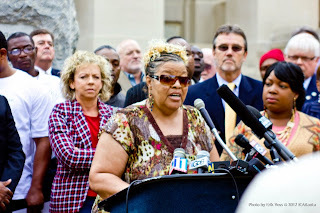 Speaking on behalf of thousands in Atlanta’s growing homeless population was Michelene Meusa, mother of two who became homeless after going from under employed to unemployed. While addressing the crowd Michelene stated, “Fannie Mae and Freddie Mac stop holding these unoccupied, vacant, boarded up properties hostage! The hostage situation is over! People always talk about “Oh, well you know, homeless people are bums.” The biggest bums are right up there (Fannie and Freddie)”. Recently Edward DeMarco, acting director of FHFA, has refused to offer principle reduction to help over 16 million underwater homeowners find relief and stay in their homes. His refusal flies in the face of suggestions from Timothy Geitner and the White House. The FHFA estimates that principal reduction could put up to $500 million back in the pockets of tax payers. Even with this they have began to sell houses at steep discounts to investors & hedge funds after refusing to reduce principal or accept rent from foreclosed homeowners. Fannie Mae and Freddie Mac are trend setters in finance capital. Should they undertake massive principal reduction to real market values, and turn homes over to communities instead of hedge funds the echoes of the housing crisis would be greatly dampened. 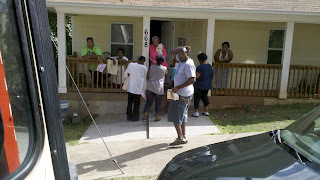 I have been with the housing authority of Fulton County for 9 years. In that 9 years this is my 5th move. Each move was due to investment landlords failing to properly maintain their properties. I have never been compensated for any of my involuntary moves. This is not the case for all families especially when the move is due to unsafe/unsanitary/inhabitable conditions but the Fulton County Housing Authority has never paid for me to move from any one of those 5 properties. I am disabled due to head and brain injuries from domestic violence and most shelters won't take me in because of my health conditions one of which is epilepsy. They see me as a risk and liability. This struggle is not easy when you're homeless and have medical problems. When I moved into my last home I had low vision because of my previous head and brain injury. I could still hear and see with special audio and visual devices. Fulton County inspected the property 5 times and ignored visible problems. I even listed things that weren't complete with the property before moving in myself and nothing was addressed. Being that I could not see very well initially, I relied on Fulton County's inspection to assure that the house was up to code. I sustained carbon and natural gas poisoning to my neurological system due to a gas leak my landlord ignored. After multiple emergency room visits my doctor informed me that my additional health issues were due to the gas leak and a faulty stove. This left me completely blind. 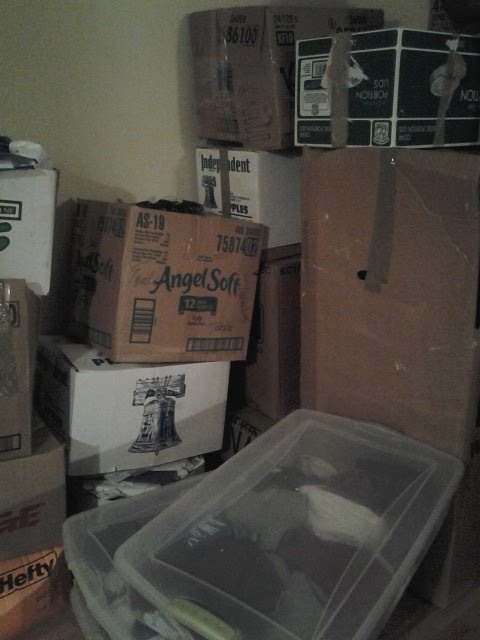 To add to this, I could not use the stove for nearly two months. I started working for the mortgage industry back in 1992 because of my mother's struggle with her mortgage. She had a 21% interest rate mortgage with Nation's Credit. I worked to help others in the area of home ownership such insanely high interest rates. 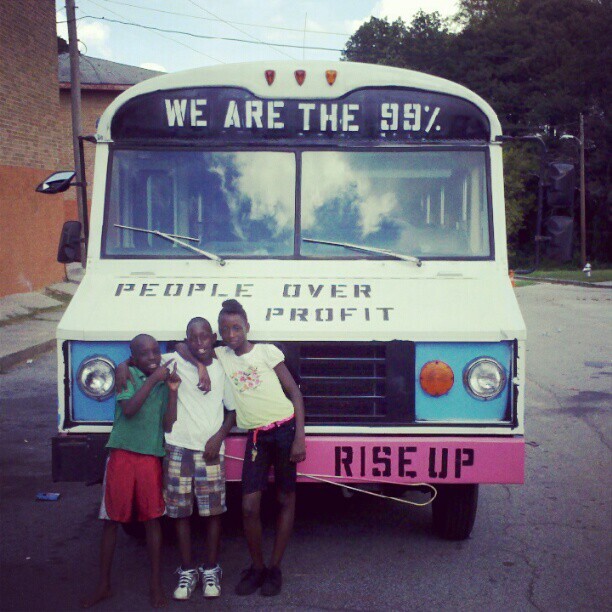 My mother's home was foreclosed on even though we have the deed that says it was paid in full. This struggle has been extremely difficult for me. I was running for my life from my abusive ex-husband who only got 9 yrs probation for what he did to me. After his probation he committed murder. I now have to struggle out here on the streets and scramble to find a new (safe) place within 160 days or else my housing voucher will be revoked. I also have to appear at a hearing to prove that the gas leak wasn't my doing as they are claiming. If I don't have evidence that I didn't cause it then my housing voucher is gone. This happened after I was questioned about even being blind. Now that I've filed a complaint regarding my many troubles with the housing authority back in 2010 they want to blame me for all my troubles and take away my right to housing. 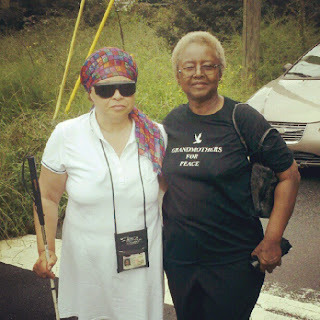 After hearing about Carolyn Harper's struggle members of Atlanta Grandmothers For Peace stepped up and paid for Carolyn to move into an hotel for seven days while she sorts things out and attempts to find a new place. Those seven days are up Monday September the 10th. It costs about $200. to pay for a week. If you or someone you know might be willing to buy another week for Carolyn please email tfranzen@afsc.org or call 404-414-5521. 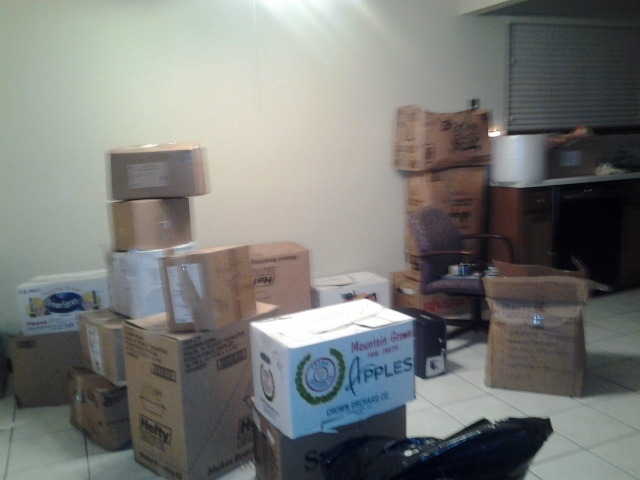 Fannie and Freddie, Here We Come! 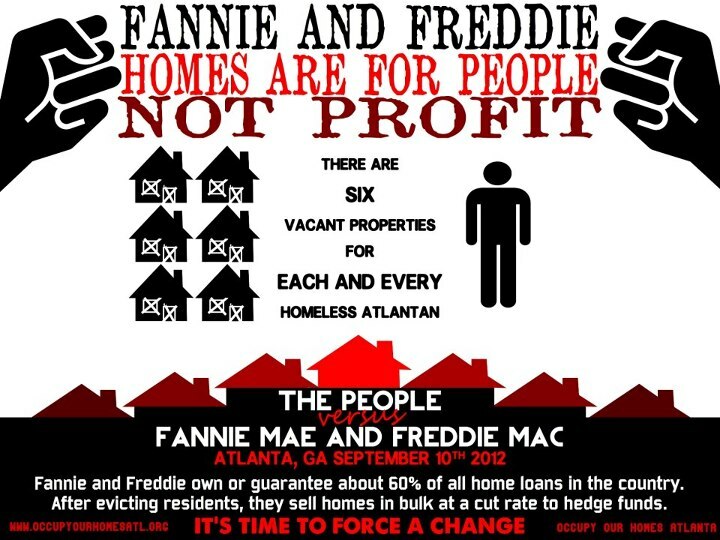 ATLANTA -- On Monday, September 10, 2012 at 11:00am, folks from all over the Southeast will march on Fannie Mae's regional headquarters, 950 E Paces Ferry Rd NE in Atlanta . 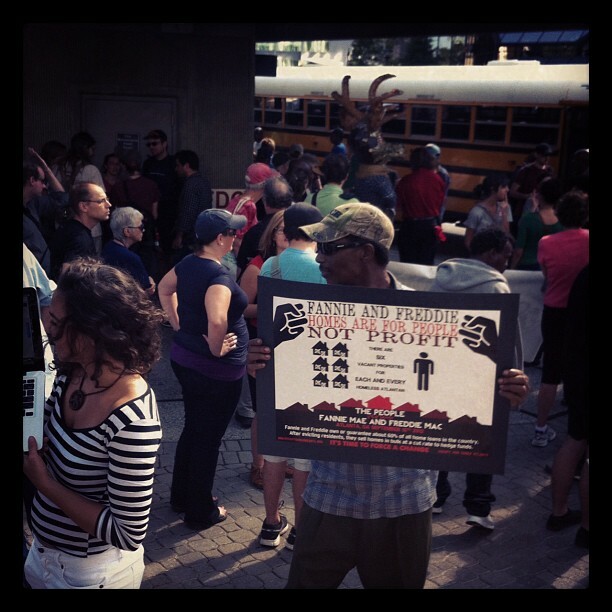 Our march will begin at the Buckhead Marta Station (across from the Financial Center on Peachtree). 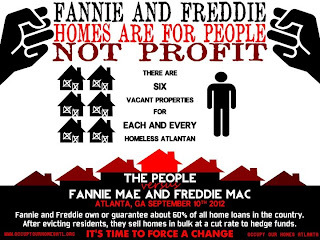 This Southeastern action is the launch of a national campaign aimed at highlighting and addressing the inhumane practices of Fannie Mae and Freddie Mac. People from Athens, Chattanooga, Miami, Orlando and Nashville will join Atlantans in holding Fannie and Freddie accountable for their abuse of our system and demand change. Many underwater homeowners who Freddie and Fannie refuse to work with will be present and demanding a meeting with Catherine Lasher of Fannie Mae. On the Eve of the event dozens of Organizers, underwater homeowners, and members of the homeless community gathered to prepare for the mobilization and discuss what a Southeastern housing justice movement could look like. 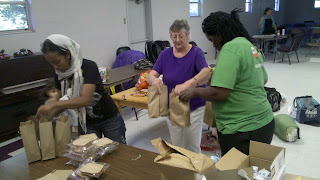 We also finished last minute tasks and packed 150 lunches for some of the bus riders coming in from various parts of the city. Currently Georgia is near the top of the list of most devastated states in this foreclosure crisis and as a region, the Southeast is the hardest hit per capita. Homeowners, renters and the homeless have been cursed by unjust practices that include refusal to reduce principal, bulk sale of homes to investors at 10-20% of market value, and holding properties hostage in communities hit hardest by the crisis. 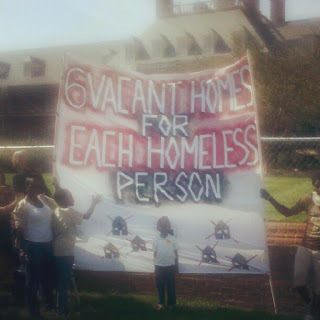 In Atlanta there are six vacant homes for each homeless person. This is not acceptable. Fannie Mae and Freddie Mac are amongst the largest players in the economy controlling about 60% of the mortgages in the US. After gambling with our homes, and buying up subprime mortgages during the housing bubble, they were placed under conservatorship of the US government in 2008, receiving billions of taxpayers dollars. Now, four years later, they continue to put people out of their homes, and are the biggest obstacle to fixing the housing crisis. American Friends Service Committee is proud to play a key role in the mobilizing effort along with Occupy Our Homes ATL, Home Defenders League, Occupy Chattanooga, Right To The City Alliance, Miami Workers Center, and others. 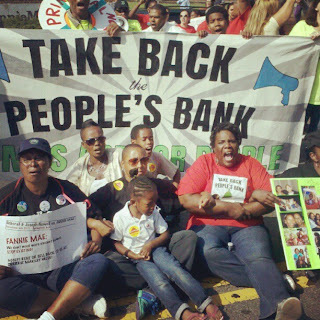 We will march on Fannie Mae's regional headquarters, located at 950 East Paces Ferry Road, at 11:00AM on Monday September 10th. Feeding The Hungry, Housing The Homeless! Today was a long hot busy, exhilarating day for the nine of us who set out to make direct contact with hundreds of struggling Atlantans. We started out at Hosea Feed The Hungry's 2nd annual "Labor Of Love" event, which provided literally tons of food, water, school supplies, job advice, and more to folks struggling to get by. Once there we had the opportunity to speak with hundreds about effective strategies for organizing for housing justice, and we of course challenged folks to attend the September 10th march on Fannie Mae and Freddie Mac. 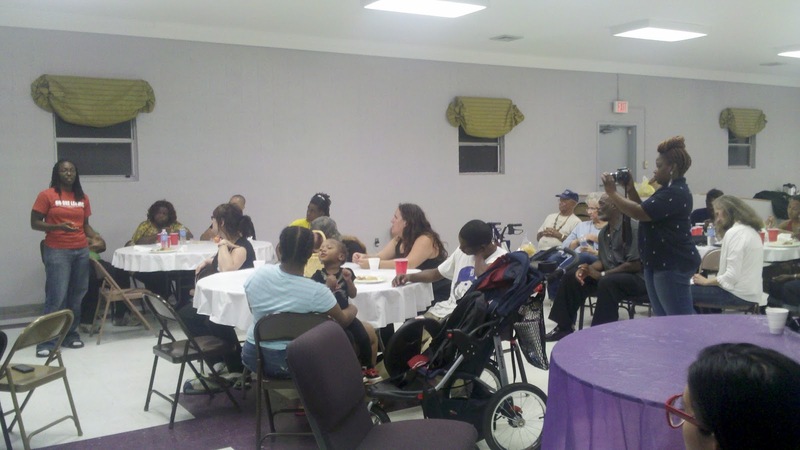 Hosea Feed The Hungry Executive director, Elizabeth Williams Omilami made time to speak with us about the work we've been doing to keep folks in their homes. When she heard we were using the bus to outreach to the hardest hit in the city she made sure we left with over 400 LB's of potatoes and 60 full grocery bags of food to distribute to folks in the community. 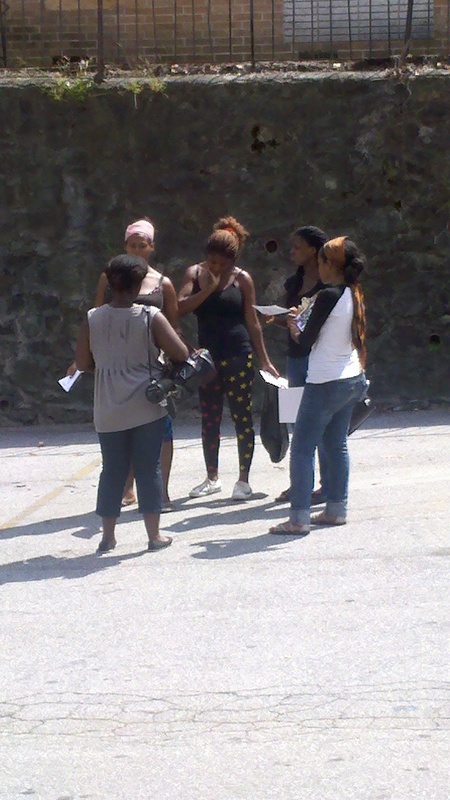 Today we were able to hit Polar Rock, Bankhead, English Avenue, Vine City, and Parts of Edgewood. 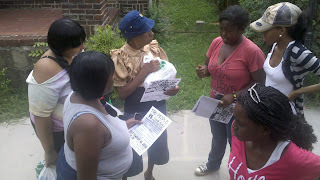 The last few days of neighborhood to neighborhood bus outreach has been an amazing experience for all of us. We're all curious to see if this kind of outreach effects turnout on September 10th. The question of the day is, how do we provide direct services(food, clothing, school supplies, ect) while mobilizing folks in a very real way at the same time, that is what we are attempting. 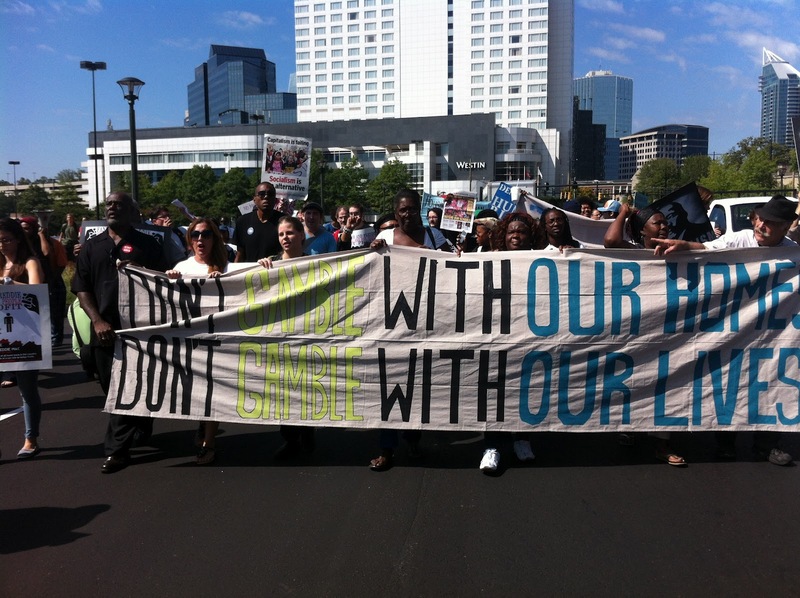 Speaking of mobilizing September 10th is set to be the largest housing justice mobilization in the south in years. Many still don't know that the housing crisis today is worse than it was during the great depression. We need a massive turnout. 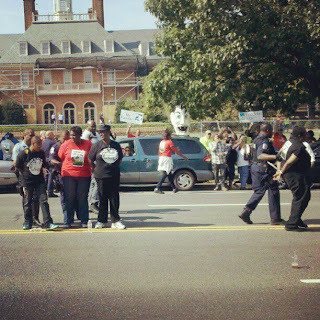 We're asking folks to take off work, go in late, do whatever you have to do to be present. We have the opportunity to flip the script here, but we can't pull it off with out you and your folks. Link to event by clicking here. 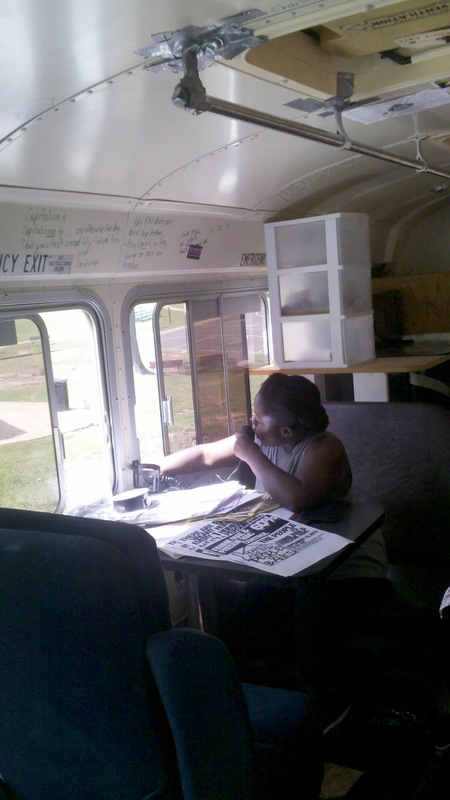 Over the last few days a five or six folks, myself included, spent hours preparing a design, cleaning, taping, and painting a bus to be used in an effort to outreach for the southeast's largest mobilization around housing justice in years. 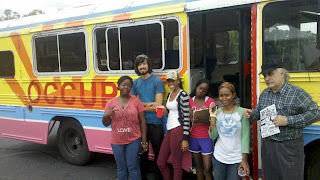 Today was the first day the newly painted bus hit the road, and it was an invigorating experience. Neighborhood to neighborhood, apartment complexes to parks the bus rolled through with a loud speaker and bus full of enthusiastic volunteers. 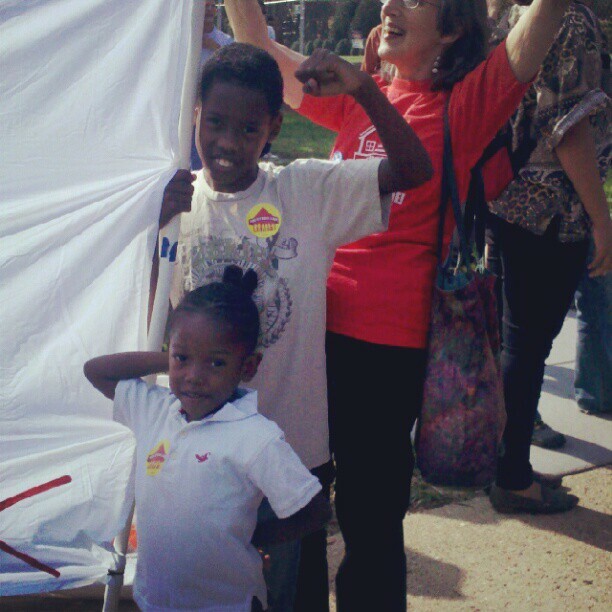 We made countless stops and talked to countless people about organizing for housing justice. We visited a number of apartment complexes known for their nasty slum lords and shared strategies to organize for fair affordable housing. 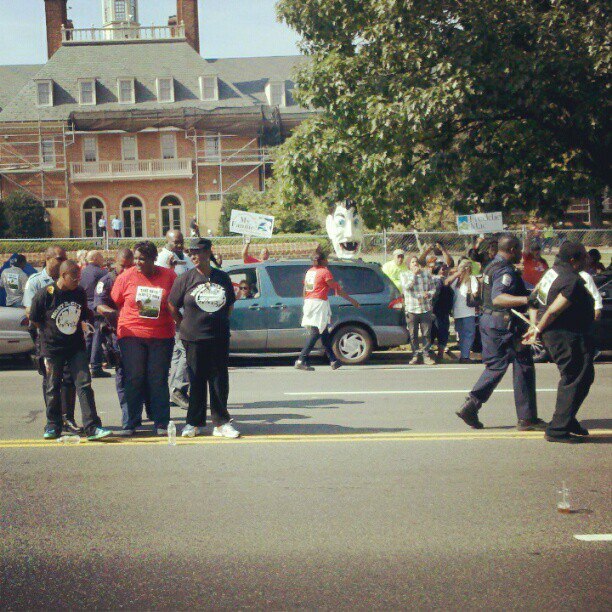 We didn't come into communities empty handed either. Today was hot, so we provided cold water and healthy snacks to everyone we came into contact with. 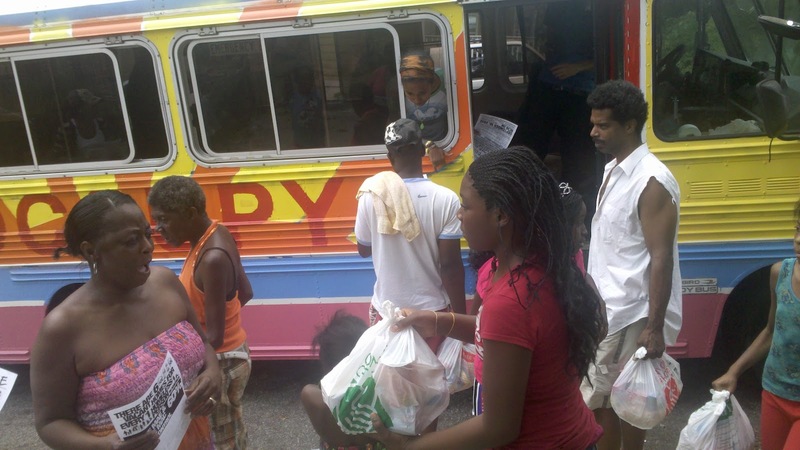 Kids are back in school, so we gave out school supplies and books. 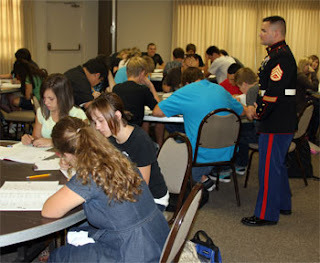 We also provided AFSC's, "It's My Life" career opportunity guild books and "Before You Enlist" DVD's to high school aged youth. Everyone we came in contact was invited to September 10th housing justice mobilization. I hope you will consider coming. Click here to see the event. I want to ask everyone that can to volunteers to make the action a success, we REALLY need volunteers in the final stretch. Click here to sign up to volunteer.